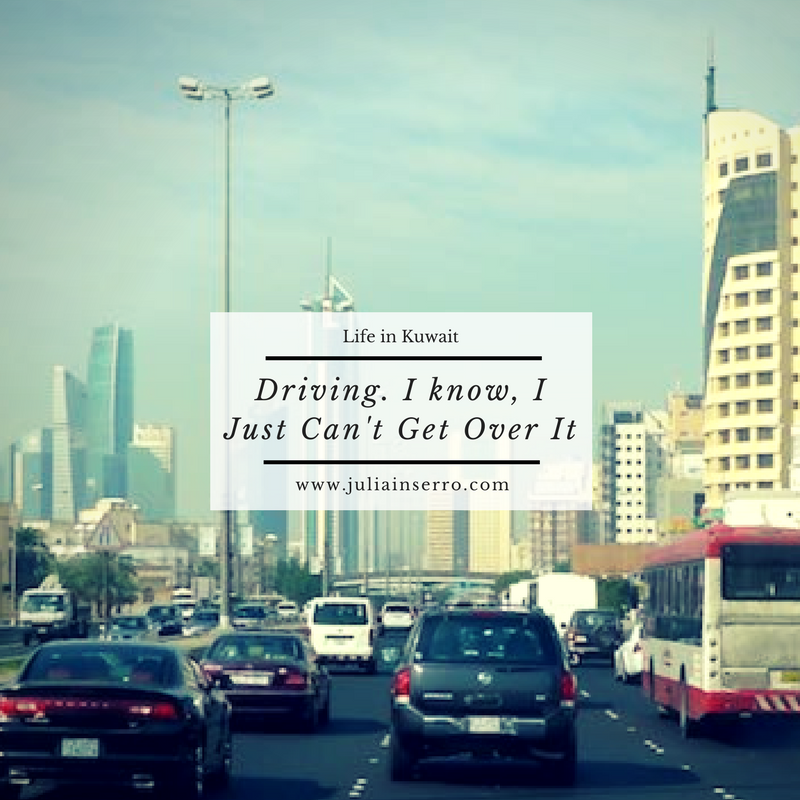 I know I kvetch a lot about driving in Kuwait. But if you threw yourself into the melee with each outing, you'd be stressed, perplexed, astonished, and filled with international road-rage as well; I assure you. Because of the preponderance of speeding idiots, we try to keep our road-time to a minimum. In doing so, we have managed to survive life in Kuwait without any accidents; though there have been far too many near misses. We have, however, been witness to many many post-accident scenes (keeping us well-stocked in horrendous car-cass photos). I did witness my first actual accident, from conception to crunching, just on the Gulf Road by our house a few weeks ago. I was at the stoplight, waiting for a green left-hand turn signal, but the traffic to my right was continuing straight as they had a green light. Opposite us they had the same configuration, with a turn lane with its own signal. But apparently their signal was optional, as I watched Mr. Idiot pull into the left-hand turn lane, and without any care, or a noticeable pause, made an immediate u-turn into the steady flow of traffic, causing an instant four-car pile-up. Luckily no one appeared injured, but I may have swallowed a fly when my mouth was stuck in the what-the-*#$! position. Bean and I have also seen two fly-swallowing feats during our Gulf walks. First we saw two motorcycles come racing towards us (we were waiting at the light for our cross-now-quickly signal) and as they passed us, they both popped up on their back wheels and continued racing down the road, perched high on their bikes, no helmets, no sense. Two o’clock in the afternoon, no parade in sight. I think Evel Knievel and Darwin both would have shaken their heads at that one. Then, as we were walking home another time, crossing at the same light, we noticed a police car parked in the intersection. This was just days after we witnessed the four-car pile-up, so I thought maybe they were there to discourage speeders and idiots. However, as I walked by, I noticed at the driver had a leopard-print neck pillow tucked under his sleeping head and the passenger was absorbed in whatever electronic gadget he held in his hands. To snore and protect, indeed. Then, as if the idiocy of the drivers wasn’t enough fun, there are other issues to contend with on top of the incredible rates of speed, carelessness, and overwhelming dearth of concern for others. The first can be summed up as: Traffic, traffic everywhere, and not a street to be signed. All over the city, street signs are either missing, have been swallowed by a nearby tree, or have been placed so close to the exit (for instance, on the highway), that you were given no notice you needed to get over and you’ve subsequently missed your exit. This latter one can then lead to the often-used double-u-turn, which is always a hoot and can add a good 20-60 minutes to any trip. Of course, if you’re a typical Kuwaiti driver, then you shun safety and physics and the silly double u-turn, and just throw yourself and your Lexus LX570 across five lanes of speeding traffic and into those folks who somehow got word and queued up on the off ramp ahead of time. Sadly I’ve seen it done more often than not. Luckily without any crunching, crashing, or spilling of bodily fluids. The second obstacle, is the “no left-turn” problem. This one can also lead to hours of fun. The only place you can make a left turn in Kuwait City appears to be at a stoplight; and there seem to be about twenty of those. So in order to turn left, you have to employ the next available u-turn lane (of which there are thousands) or the traffic circle (of which there are hundreds). In theory it works, and even in practice it works, for the most part. But there are some places where the next available u-turn is two miles down the road, so relax and enjoy the view, you have no choice.